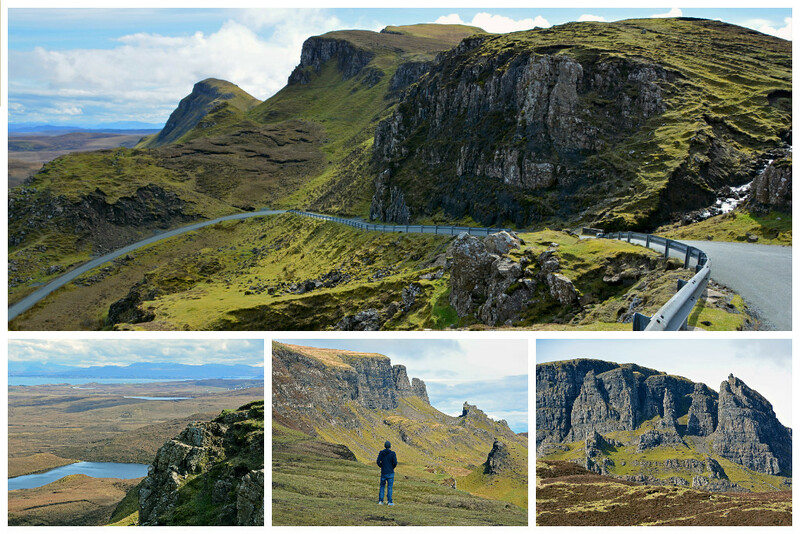 We had high expectations for the Isle of Skye, given that it is pretty much Scotland’s most talked about island. 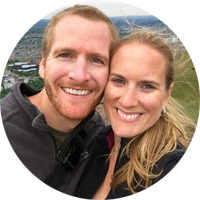 Having been enticed by countless accolades and magical pictures in magazines and on the ‘net, we made it a priority to visit on our second trip to Scotland. 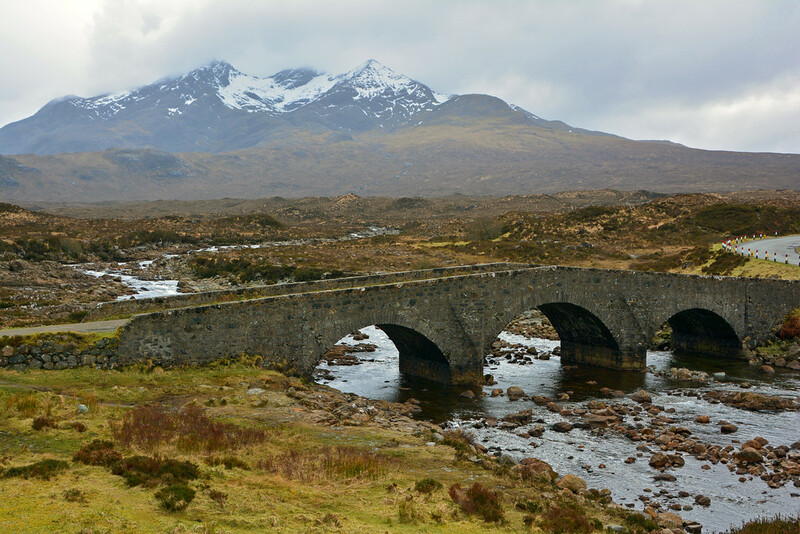 The Cuillin Mountains dominate the horizon in Skye and the area is perfect for adventurous walkers and climbers to explore. It is recommended that you hire a guide if you plan to do more than just a leisurely walk around the base of the mountains. This region was sculpted by the advancing and retreating of glaciers over the last million years. Geologists have discovered that the insides of extinct volcanoes appear on the surface of these mountains, making it a great place for researchers to study how volcanoes form. 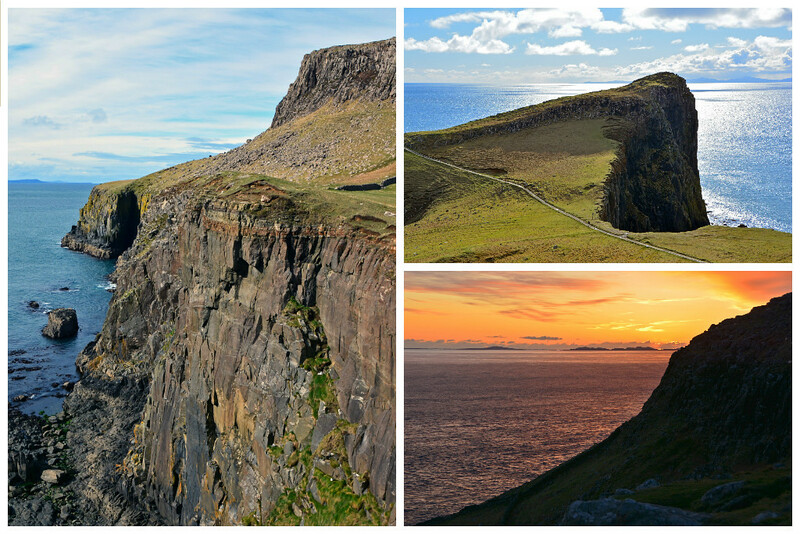 In addition to Neist Point, the Quiraing is another awe-inspiring landscape not be missed on the island. 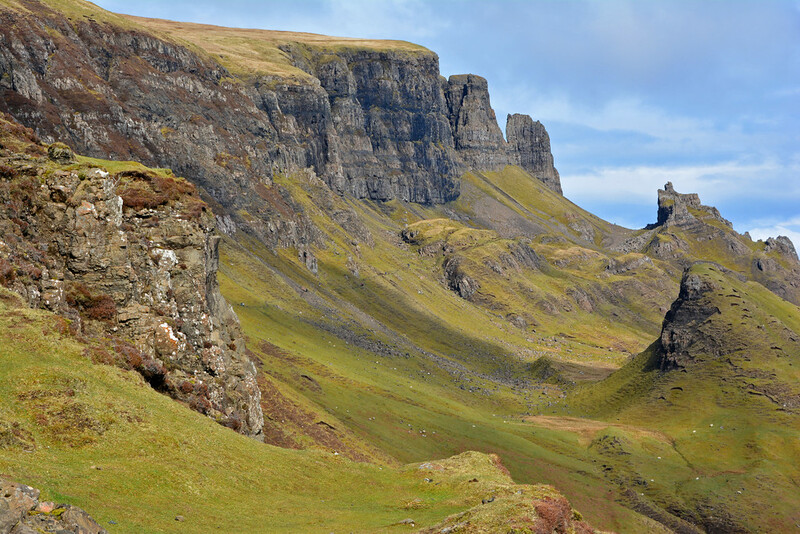 It is a part of the Trotternish Ridge, which contains over 20 miles of rock formations and pinnacles as a result of massive landslides centuries ago. 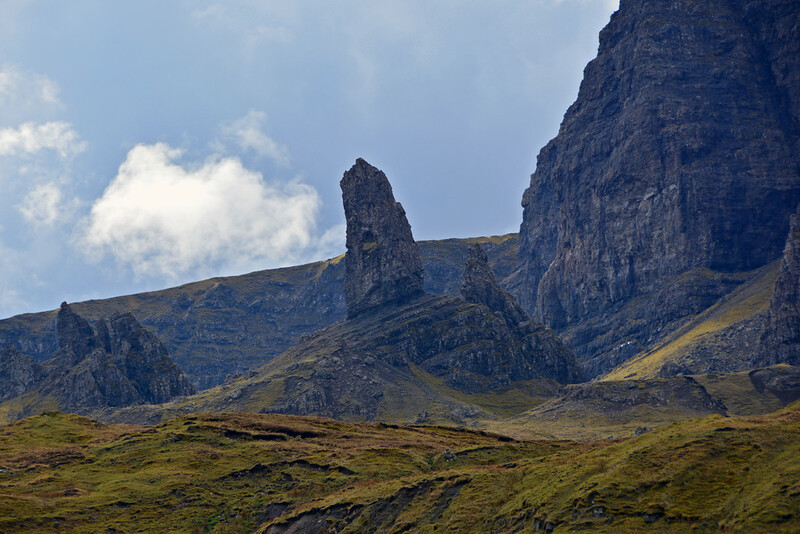 Old Man of Storr is just one of many fascinating rock pinnacles in the Trotternish Ridge, yet it receives the most recognition. Unfortunately, our visit to see the ‘old man’ was restricted by threatening rain clouds, which within minutes of us being on the trail, opened up to a hike-halting downpour. So, if the weather is on your side or you’re more prepared with weather-resistant clothing than we were, climb the steep 2.3 mile (3.8 km) round-trip path leading to this 160 feet (48 m) pinnacle. 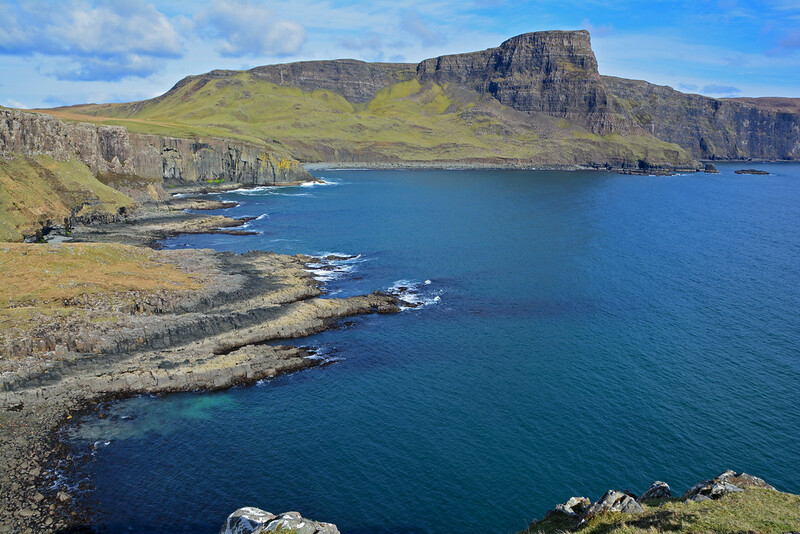 We hear this hike offers outstanding views of the sea and the Islands of Raasay and Rona, though we may never know. So if you make it there yourself, please send us a picture! 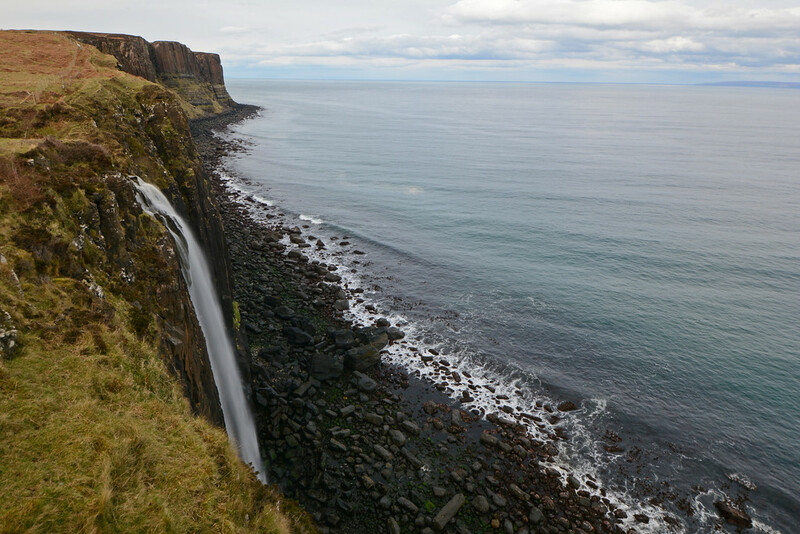 At Kilt Rock, the gentle Mealt Waterfall freefalls almost 200 ft (60 m) into the Sound of Raasay below. There is a viewing area for the falls, though it is somewhat difficult to capture all of its beauty unless you are on a boat viewing it from the water. 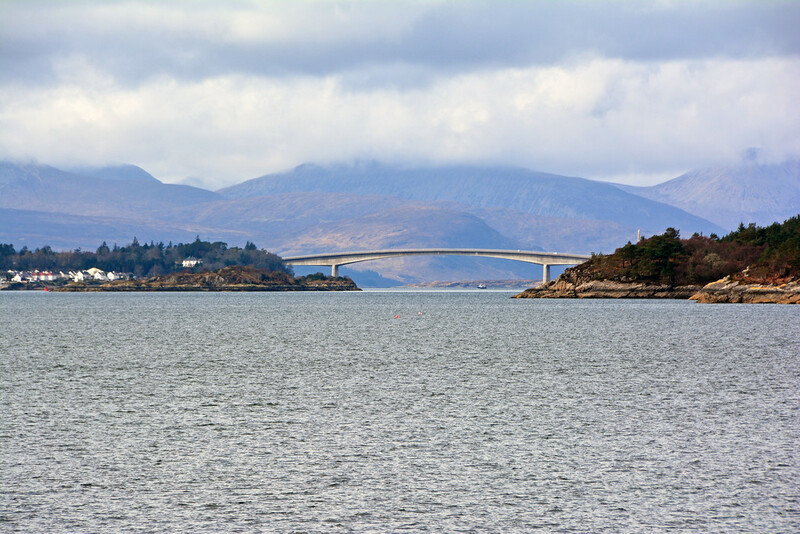 A boat tour would also be a great way to experience all of the marine life in the waters around Skye. Opposite the viewing area is a coastal overlook. 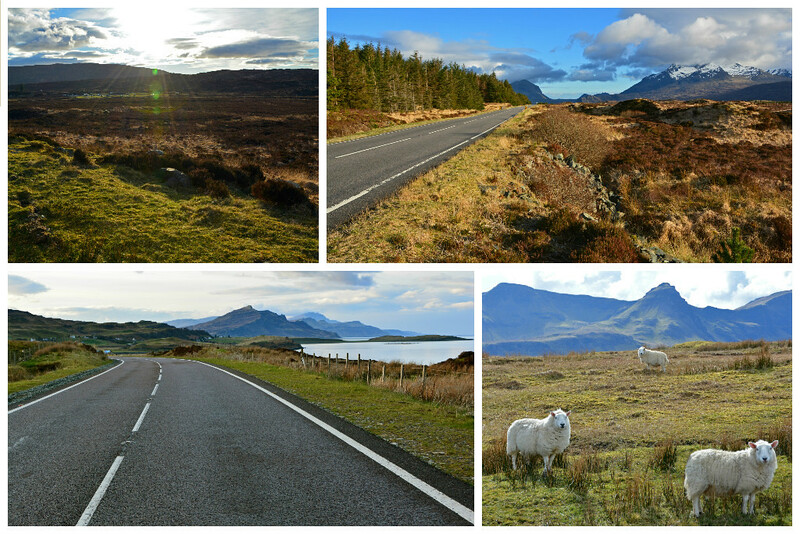 There really are spectacular views everywhere you look on Skye! Just a 5-minute drive from the Kilt Rock viewpoint is Lealt Falls. 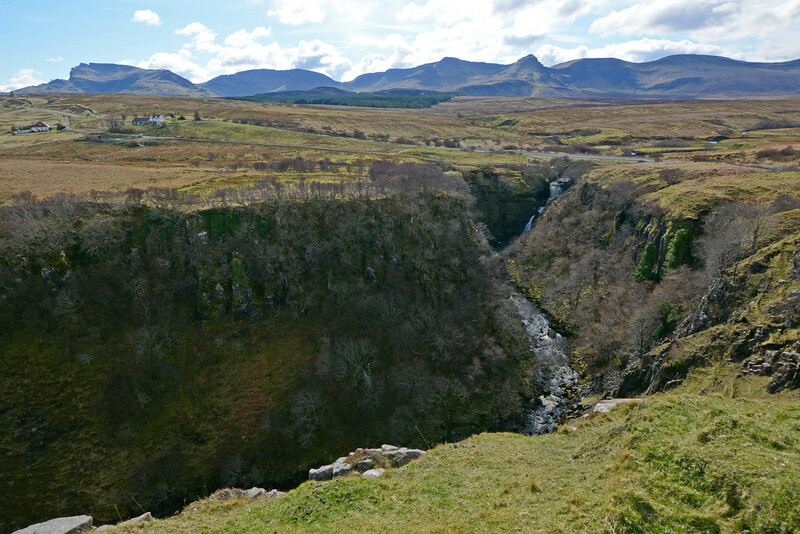 Though not quite as impressive as its neighbor down the street, Lealt Falls is wedged between a crevice in an expansive landscape lined with the Trotternish Ridge sitting on the horizon. There is parking lot to the right of the falls. Follow a well-trodden path to a hilltop where you will find the remains of a diatomite production process below. Diatomite is a whitish, clay-like deposit made up of the microscopic shells of diatoms. It was extracted from the loch, transported by railway, and used for industrial purposes, such as insulation for ship’s boilers, filtration for beer, and in the production of paints and polishes. It was also used in the manufacture of dynamite. Neist Point is easily our favorite spot on the island, and we would objectively rank it as one of the top 3 most beautiful places on Isle of Skye. Maybe it was simply because the weather was perfect the entire time we were there or maybe because it’s just that gorgeous! 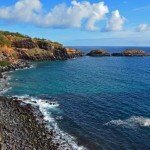 Being the most westerly point of the island, it is a little bit off the main road, but oh so worth the effort to get there. From the parking area, there is a very steep descent taking you down along a path leading to the lighthouse at the end of the point. Please use caution and do not walk too close to the cliff’s edge. 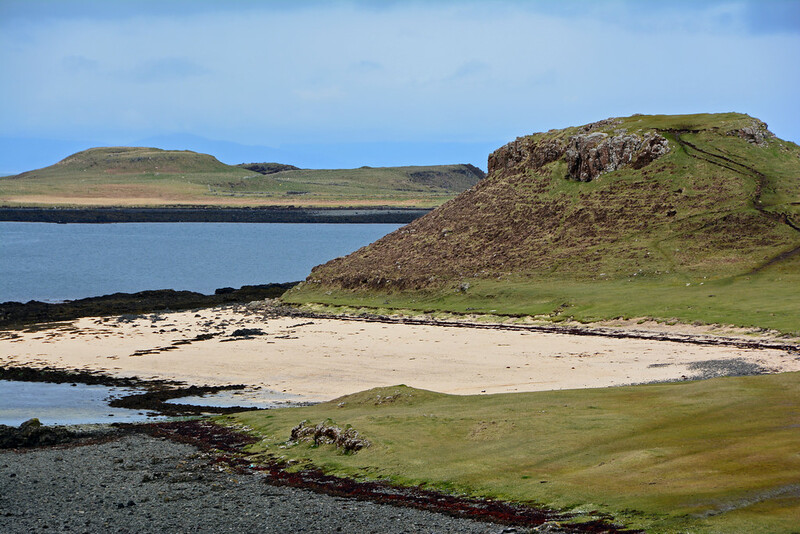 From here, you will have excellent views over Moonen Bay to Waterstein Head and out over the Minich to the Outer Hebrides. Keep your eyes peeled for porpoises, bottle nose dolphins, and minke whales from the shore. You may even catch a glimpse of a basking shark (late April-end of summer). We loved the views at Neist Point so much, we abandoned our evening plans and came back to watch the sunset, which did not disappoint! We ended up spending the night wild camping in the parking lot in our campervan. 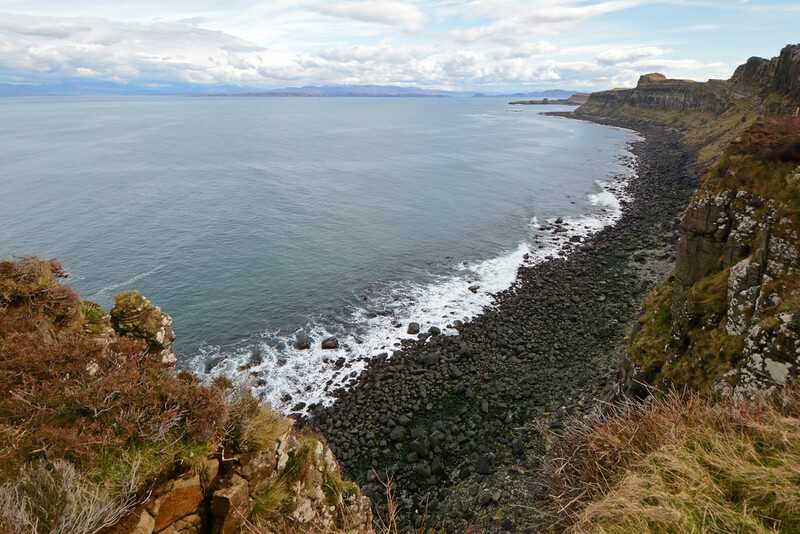 We’re adding the Coral Beach of Claigan to this list, because it’s something we really wanted to see during our visit to the Isle of Skye. It looked absolutely gorgeous in all the pictures we had seen, but it failed to live up to the expectations we had. To begin with, there aren’t many signs leading the way. It requires a long drive down a pothole-ridden road,only to arrive and find out that it’s still a mile walk from the parking lot. Normally, we wouldn’t complain about a mile hike, though a threat of rain hovered over us the entire time we were walking. The path itself wasn’t clearly marked at a particular fork in the trail, and we weren’t the only ones who went the wrong way. After walking about 2/3 of the way, the path simply became too muddy for us to carry on, so we only viewed the beach from afar. We regret to say that we were rather disappointed. It was low tide for most of the day during our early April visit and the sun was hidden behind a thick layer of clouds, so unfortunately we didn’t experience the vast beach and crystal blue waters we saw advertised. We’re still leaving the coral beach on here because be believe that, in the right conditions, it could still be worth a visit. 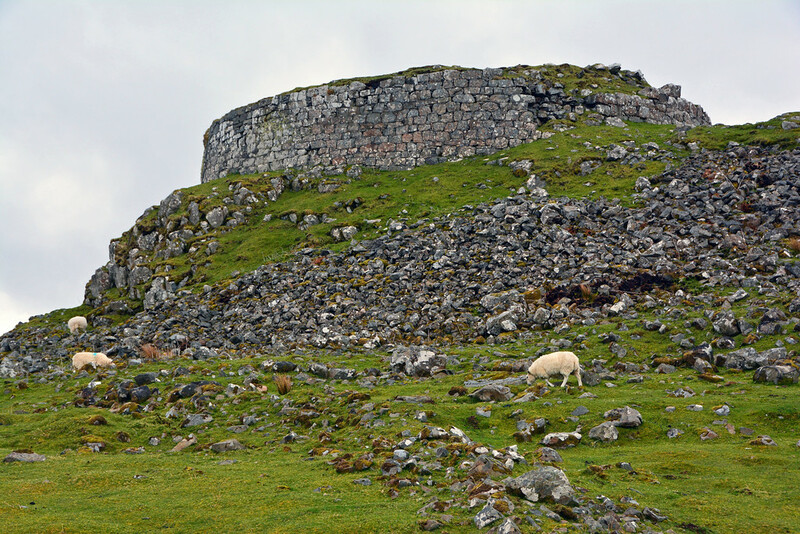 Dun Beag is the best preserved, most accessible broch on Skye; a broch being a type of fortification only found in Scotland. It is interesting to note that no one really knows why brochs (and duns) were built, though we do know that this particular structure was likely built around a few hundred years BC and reoccupied in medieval times. 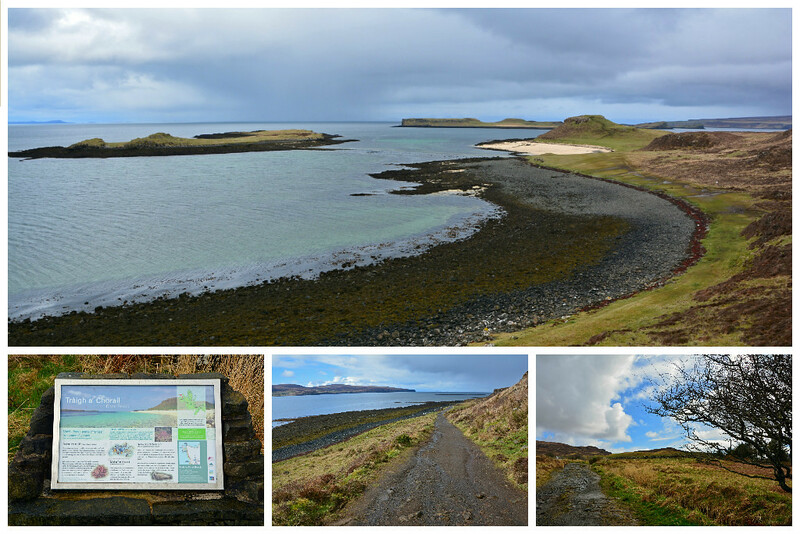 Translated to mean ‘the small fort‘, Dun Beag can be accessed by a short, but often muddy, walk from the A863 near Struan. Many of its walls are still intact and stand over 6.5 ft (2 m) high. Unfortunately, we got close, but didn’t actually make it all the way to the fort as strong winds and rain quickly moved in. 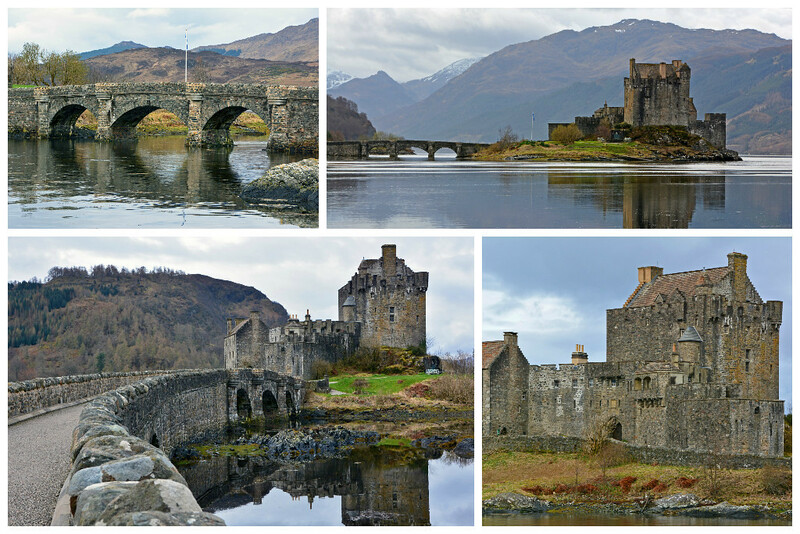 Though technically not on the Isle of Skye, Eilean Donan Castle‘s close proximity to the island warrants a mention. 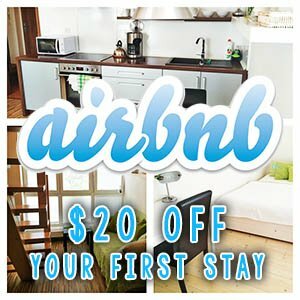 If you’re traveling to the Isle of Skye, you might as well stop by! It’s one of Scotland’s most romantic (and most photographed) castles. Follow in the footsteps of warriors past including Vikings and Jacobites. An entrance fee is required to go inside the castle. Opening hours are from 10:00 am-5:00 pm (April, May, June and October), 9:00 am-5:00 pm (July and August), and 10:00 am-3:00 pm (February, March, and November). So, obviously this isn’t a comprehensive list of everything there is to see on the Isle of Skye. 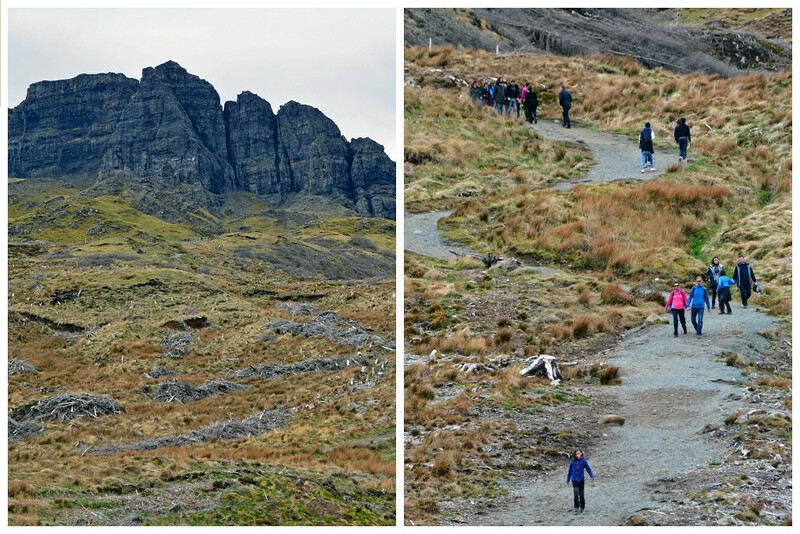 Despite our short (2-day) visit, we saw a lot of the highlights and still have plenty to do if we ever make it back, like a visit to the Fairy Pools or a stroll through Portree! Of course, if you’ve been to Skye before, we’d love your suggestions on places we missed this go ’round. 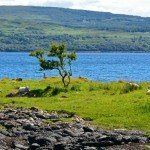 My friend and I are planning to drive the North Coast 500, or parts of it in 2017. We are in our late 60s, and would like to know if there’s just as much to be seen from the car. Walking long distances is not our “thing”. Thanks for any advice. Hi Barb! You will absolutely love this region of Scotland. 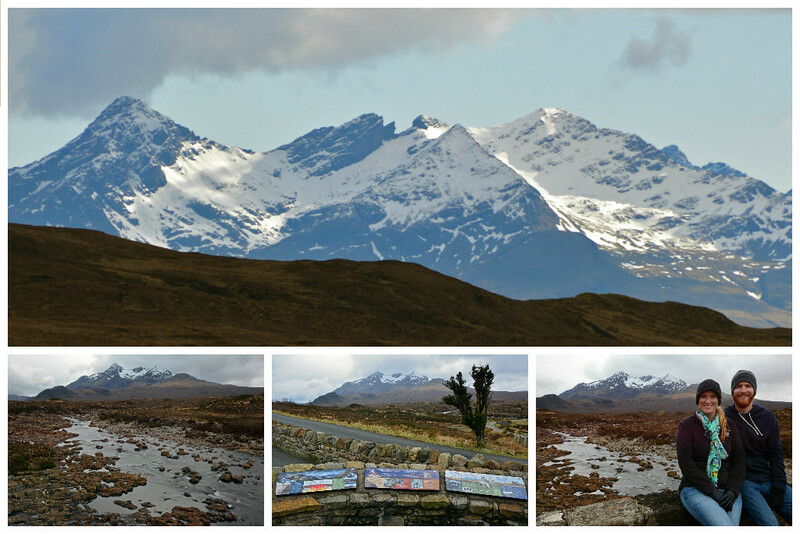 So much beauty, and yes, a lot of it can be seen from the road or by very short walk along both the North Coast 500 and on the Isle of Skye. 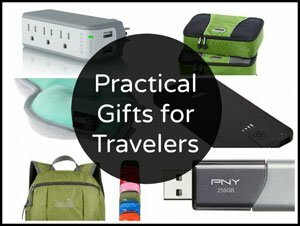 There are also plenty of options for those more adventurous, but we believe that you will still have a wonderful time without much walking. Although, the Stacks of Duncansby in John O’ Groats on the North Coast 500 require a 1 mile (roundtrip) walk from the parking lot and Neist Point on Isle of Skye requires a very steep descent on stairs and paved walkway. However, the coastline at Neist Point is amazing from the parking area, so it’s still worth a visit, even if you didn’t want to do any walking. 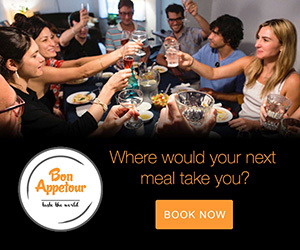 Have a blast on your road trip adventure! Thank you. I appreciate your taking the time to answer. 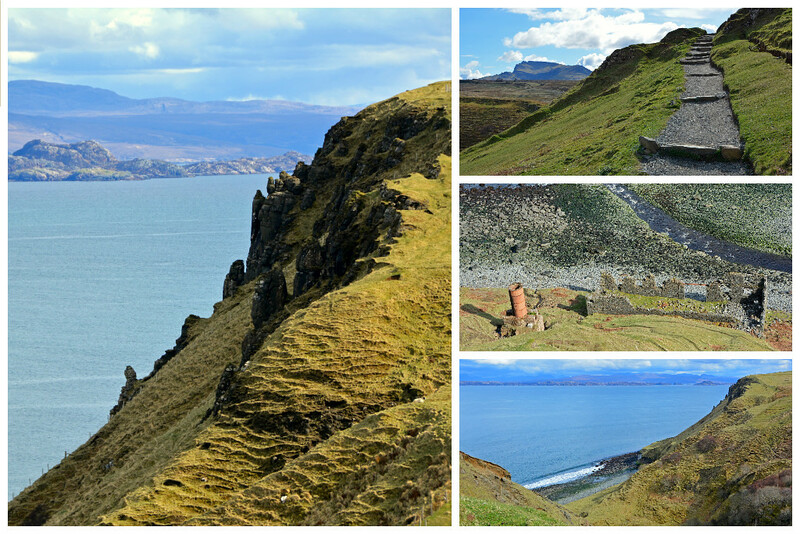 You will LOVE Isle of Skye… so much beauty! Fingers crossed for good weather! 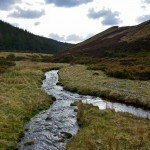 Check out our post about Wild Camping in Scotland to see where we camped – https://forgetsomeday.com/wild-camping-in-scotland/. 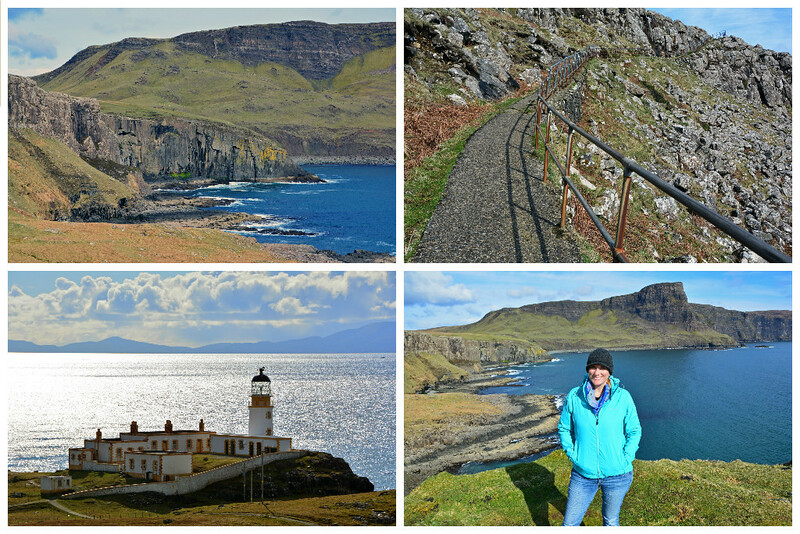 Neist Point was our absolute favorite! !